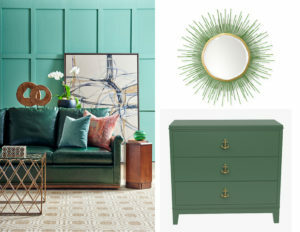 In anticipation of spring — and a nod to St. Patrick’s Day — we explore the many shades of green — from kelly to kiwi — and check in with interior designer Suzette Donleavy for her take on this nature-inspired hue. “What’s not to love about the rich hues of green?” says Donleavy, principal of Well-Designed Interiors in Rumson. From the first “Spring Green” we find on the buds this time of year, to the mature “Leaf Green” against a brilliant blue summer sky, “green is an inspiring color for any room,” she says. Recently Donleavy combined pear green and pink in a client’s living area. Another project currently underway incorporates pops of green to a classic black and white scheme. Outdoors, she livened up a seating area with grassy greens and marine blues. “As in nature, green gives us balance and harmony in design,” Donleavy says. Left: Designer Suzette Donleavy – pictured with son Jack – readies for the St. Patrick’s Day parade in Rumson – where family, friends and clients often gather to watch from the vantage point of her design studio. Right: Pairings of pear green and pink – and classic green and white – in a client’s home resulted in a “happy, cheerful space,” Donleavy says. Left: Brushed brass nailheads lend just the right amount of detail to a rich leather sofa from Wesley Hall. A brass and glass top cocktail table and warm wood accents complement the look. Top Right: Hand-painted gold coco shells and emerald green buri nut beads radiate from a gold metal frame on the Sadie Beaded Mirror from Palecek. Bottom Right: Brass anchor-themed hardware brings nautical flair to Oomph’s green lacquered Neverland Chest. Left: Lime-toned fabrics in “Jane Leaf” and “Flourish Sweet Pea” add punch to an otherwise neutral base. Upholstery, CR Laine; coffee table and cabinet, Furniture Classics; artwork, Wendover Art Group; platinum and white rug, Dash & Albert. Right: Varied-width vertical stripe wallpaper (Cole & Son’s Marquee Stripe in “Fresh Leaf”) makes for a tasteful and timeless accent wall in the kitchen. 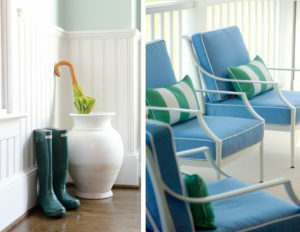 Left: Indoor/outdoor pillows from Elaine Smith feature runway-inspired designs in go-to-emerald and navy colorways. Right: The Heston bedding collection from Eastern Accents sports a tried-and-true preppy palette. Left: A brown and green color story is a winning combination in fabrics and wallpaper from Thibaut. Center: Tiles reference a subtle Celtic motif comprising six shades of marble in a lower level commercial-inspired bathroom in Far Hills. Walls, painted in Benjamin Moore’s Barrington Green, bring out the beauty in the wood-stained woodwork and antique stalls, salvaged from a former school in Atlantic City. The settee is an antique that retains its original finish and regal velvet fabric. Photo credit: Design NJ-Oct.-Nov., 2011/Photographer: Peter Rymwid/Designer: Carisa Mahnken/Tile: Mediterranean Tile & Marble in Fairfield/Vintage stalls: Recycling the Past in Barnegat. 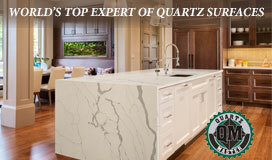 Right: Deep-green cabinets from Wood-Mode bring a range of earthy tones to life in a rustic, mountain retreat kitchen. 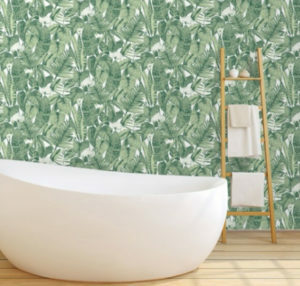 Tropical Jungle Green wallpaper – from Brick-based Tempaper – makes you feel like you’re at an island getaway. The self-adhesive wallpaper is easily removable if you opt to change things up. A green and oxblood red scheme – balanced by doses of white and creamy tones – lend drama. 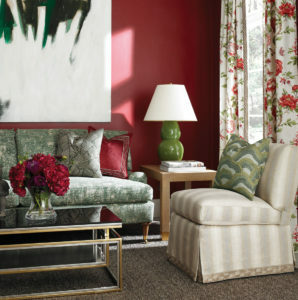 Fabric and upholstery by Kravet.